Last Thursday I went to an Adidas Boost event at Kaiser Sport. I am now an official Adidas Boost Ambassador! 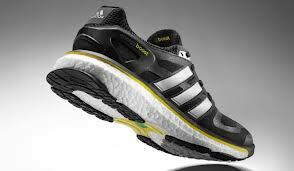 On Friday I tested my new Adistar Boost trainers out on a hill run and was liking them a lot! The energy does indeed seem to be returned back to you as you bounce down the road :-) The trainers 'hug' the feet so they feel all nice and snug. There is no pinching or foot suffocation though. My toes don't feel tight and actually feel very comfortable. Today I decided to dress up in the whole Adidas Boost gear with a t-shirt, jacket, running tights, and, of course, the trainers, and then take a 10k run around the city centre! For the first 6k I didn't notice so much difference between my Adistar Boosts and my Brooks trainers just the bouncing like before but after this distance my legs seemed to have a life of their own! I have never experienced anything like it before and it's very hard to describe the feeling. The best I can come up with is a 'runners high for legs'. This is something that has to be tried to be believed! Rock 'n' Roll Edinburgh Half Marathon Write up!